With Nvidia’s Pascal graphics architectures, gamers and power users are getting a good bang for the buck than ever before, as we see more powerful cards trickle into the laptop category, affordably. Its GTX 1060 graphics card paired with Intel’s Kaby Lake processor make the ASUS FX502VM-AS73 a capable machine, while maintaining the cost down–at least, for the category. This midrange gaming laptop isn’t cheap, just affordable considering the components it packs inside. Still, its underwhelming design isn’t something to be enthusiastic about, you’ll have to make the tough decisions between form-and-function. On a feature-by-feature basis, it comes really close to our Editors’ Choice midrange gaming laptop, the ASUS GL502VM-DS74 , with both boosting a nice build, and future-proof components that will remain relevant for a few more years. Though it doesn’t bring anything new in terms of shape or size, the 15-inch FX502VM isn’t too hefty or thick at 0.9 by 15.4 by 10.5 inches (HWD) and 4.9 pounds. It’s portable enough, can easily slide into a backpack and binge on the latest titles at a friend’s place, but having lugged it home I won’t be of the opinion of toting it around frequently. The ASUS GL502VM-DS74 measures exactly the same, though, other gaming laptops remain considerably meatier like the Acer Predator 17 (G5-793-72AU), but majority of competitors are in the same ballpark. For instance, the Dell Inspiron i7559-5012GRY is a smidge lighter at 4.6 pounds, while the ASUS K501UW-AB78 comes in at 4.4 pounds. If you need to carry it around, you can slide it into the Bonvince 18.4″ Laptop Backpack, which has nicely placed compartments for the power adapter, mouse and other peripherals. The 15.6-inch, matte-finish display gives you the benefit of both a wide viewing angle and reduced reflections from ambient lighting. It’s a bright screen with a 1,920-by-1,080 resolution, which on first flush can seem a little small when high-end ultraportables have 4K screens like the MSI VR Ready GS73VR Stealth Pro, but 1080p is better for mobile gaming. For such a small machine, butter-smooth 3K or 4K animation would require at least three GPUs, which is quite impractical on a laptop. For instance, the GS60 GHOST PRO 3K-097 has trouble keeping up with smooth frame rates at its native resolution of resolution of 2,880 by 1,620. The FX502VM-AS73 does a fine job at native resolution with all the eye candy turned on. The red, backlit, chiclet-style keyboard is comfortable blends well with the black chassis, and is among the comfortable keyboards have used lately (offering up to 1.4mm key travel distance), with enough space for a full numeric keypad. The touchpad is very responsive, and it features highlighted WASD keys, which make it comfortable during long gaming sessions. Speakers are loud and clear, with a subwoofer for a little extra low-end sound. It uses Hyper Cool Duo-Copper cooling system with dual rear vents, so heated air is channeled away from the user. Connectivity is excellent. The sides are choked with I/O ports, including: three USB 3.0 ports, an Ethernet port, a headphone-out & audio-in combo jack, an HDMI port and a Mini Display port. Wireless connectivity comes via Integrated 802.11 AC and Bluetooth 4.0. If you occasionally binge on movies, the Nvidia GeForce 1060 can drive up to three displays simultaneously (the internal display, HDMI and mini Display port), allowing you to have game screens, instant messaging, Web browsing, and a movie all playing at once). You also have a built-in HD Web Camera, though, you don’t have an optical drive on this model, though you can get it on the ASUS ZX53VW-AH58. The system comes with Windows 10 (64-bit) pre-installed. How does the FX502VM-AS73 stack up gaming-wise? Inside, there is a seventh-generation Intel Core i7-7700HQ 2.8GHz (Turbo up to 3.8GHz) processor, Nvidia GeForce GTX 1060 discrete graphics card (with 3GB DDR5) 16GB DDR4 (upgradable to 24GB) system memory and 128GB SSD+1TB (5400 rpm) storage. A potent mix of features in a portable gaming laptop, usually found in high-end laptops. As always, newer cards invariably result in a bump in performance, and we see an improvement in gaming performance from its predecessor the ASUS ZX53VW-AH58 with its Nvidia GTX 960M graphics card. You’ll get good frame rates on most modern titles played at high-ultra settings including: Fallout 4 (high-78 fps; ultra 67fps), The Witcher 3 (high-66 fps; ultra 39fps), and GTA V (high-91 fps; ultra 48fps). This measures are pretty at par with most high-end gaming laptops with the same configuration, but cost far much more. However, more demanding titles at ultra resolutions will force you to tone down the eye candy, but it’s still acceptable keeping in mind that the card is also ideal for use with VR headsets, with smooth VR performance. Being a quad-core processor, the machine can pretty much deliver on anything thrown its way, and if you have some bottlenecks, it won’t be the processor for sure. During our tests, the system remained surprisingly cool and quiet even after hours of use. The system was able to complete media projects in record time and I was even able to edit some HD videos and process some spreadsheets concurrently without the machine stuttering. This is quite something the office user or student who once in a while indulges in MS Office projects, but later jumps into gaming. Battery life is average for a gaming laptop, at 3 hours 49 minutes on our battery rundown test. That’s within a few minutes of the three hours and change garnered by the Alienware 17 (2014) and the Origin EON 17-S. The outliers are the Origin EON17-SLX (1:13) and the battery champ Asus ROG G750JZ-XS72 (5:32). Basically, all of these systems will work untethered for a short period of time. Gaming-oriented processors and large screens tend to drain battery life quickly. The ASUS FX502VM-AS73 is an excellent value, offering good gaming and productivity performance at a reasonable price. It scores close to more-expensive systems during testing, even beating them in some cases. Plus, it sports a solid design, a full HD display and still manages to include extras like a backlit keyboard, and decent port options. Compared: it does eschew competitors with its snappier 128GB SSD+1TB storage, latest GTX 1060 dedicated graphics card, Kaby Lake processor and backlit keyboard. 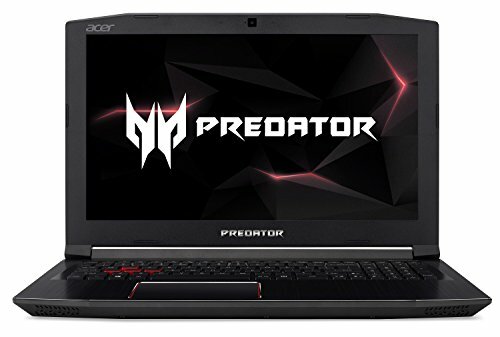 All these make it an easy choice to recommend for anyone in the market for a gaming laptop that will also suffice for media creation and video editing when not playing games. 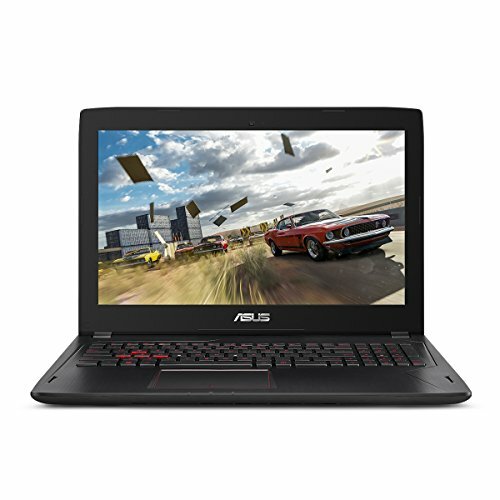 That said, the ASUS GL502VM-DS74 remains our Editors’ Choice midrange gaming laptop as it beats its rivals on a feature-by-feature basis with features such as 16GB of system memory and the latest Pascal-based Nvidia GTX 1060 graphics card with (6GB-DDR5) that make it formidable enough in terms of gaming performance and processing power. The ASUS FX502VM-AS73 is a reasonably priced entry-level gaming laptop that packs Pascal graphics and performance of a Kaby Lake processor into a portable, yet, powerful notebook. This gaming laptop includes tons of storage and good port options, and sports a great game inspired-design.